Deanna Shrodes: Is this really true? I find myself getting very philosophical about things like this and meditating on it for days. 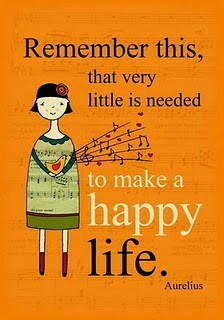 Is it really true that very little is needed to make a happy life? I'm convinced that it's true, especially for Christians. I remember the first time I worshipped in Mathare Valley, in Kenya, Africa with some of the most poverty stricken people in the world. They don't have running water (other than sewage running with rainwater in the alleyways of the slum) and they don't have electricity or toilets or all the things we have. Dogs are loose wild animals and not pets, and they don't have healthcare or coffee bars on every corner, but they do have happiness. When we worshipped in the church that November morning, it was amazing to see so many fall to the ground worshipping, crying out with a loud voice, "THANK YOU, FATHER! THANK YOU FOR ALL THAT WE HAVE!" Yes, I felt like an idiot, and yes, I wept. I thought, "what do they have, Lord?" They quickly taught me about what it really means to be blessed. This week I have been really happy. Ironically things are a little tight in our household this week. Not by African standards, but by American ones...we have paid our bills but don't have extra money left over. I haven't been buying Starbucks or even going Christmas shopping or anything extra. We've done things like stay home and make soup and clean the house.